Describe an incident or write a fictional story of how someone got falsely accused of a crime and how they handled it. Feel free to leave an open ending but be sure to include enough details to make it interesting. Your story should include the alleged crime, the penalty the defendant would face in your state if convicted, and an anecdote of how they dealt with the situation. The Essay has to be 1,500 words or less. Post the essay to your blog. This can be a student blog on your university website or your own personal blog. If you do not have a blog, you can create one here for free: www.wordpress.com. Include at least three “clickable” links to authoritative sources. At least one of these has to go to an article on Keller Law‘s blog. We added some below to get you started. Feel free to use different posts from our blog archive as well. Please note that the link to kellerlawoffices.com must be “clickable,” meaning that it is not enough to simply cite to the post. (Quick tip: In order to make a link clickable, highlight the entire link, click “Command + K” on your keyboard). Essays submitted as GoogleDoc Files, private blog posts, etc. will not be considered. Will Delayed Processing of Sexual Assault Kits Compromise Evidence? Students who give us a social-media shoutout will be credited with one bonus point per social-media channel. The shoutout should include a link to the kellerlaw.com website and a tag (link) to our respective Social Media Account. 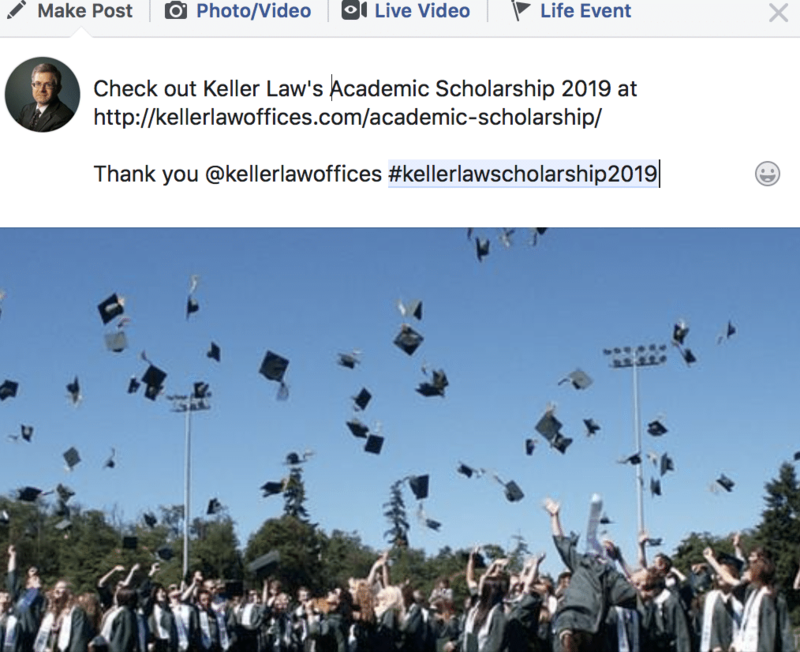 Please use the hashtag #kellerlawscholarship2019 so we can find your account easier. July 15, 2019 – All applications are due. September 1 2019 – Scholarship recipient will be notified via email or phone. September 2019 – Scholarship funds will be disbursed to the college or university. By submitting your application, you consent to Keller Law Offices publishing your essay and picture on kellerlawoffices.com. Keller Law Offices has the sole right to resolve any disputes which may arise in the selection of the award winner. There will only be one award allotted.